Hello, hello! You've landed at Mig Reyes's design portfolio, the quirky corner on the internet which serves as a home to Mig's design, doodles, thoughts and thanks. It's also your 411 on Mig's life. 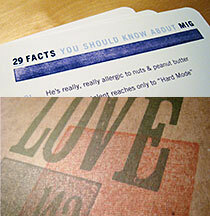 did you know that Mig is extremely allergic to nuts, including all things peanut butter? Halloween is definitely tricky. No joke, the new website is starting to take shape. The favicon is just a small hint at what's to come. New work will be up on the launch, stay tuned. Boston was a great experience, and the HOW Conference was loads of fun. It's back to business. Keep a look out for an all-new site featuring some new work! For all of the HOW Conference madness, check out the Gets Invaded blog. A special hello to all of the new friends I made along the way! Are we connected on LinkedIn, yet? Join my Chicago friends and I as we invade the 2008 HOW Design Conference. We're blogging about everything, and putting our photos on Flickr. Follow me on Twitter, too. All the random Boston experiences are tweeted here! Love with Rockport, STA and AIGA. Ah, February, the time for getting your loved one sweet gifts. Out of ideas? Check out your closest Border's Bookstore, or click on over to Amazon. Rockport's LogoLounge IV is finally published and on store shelves, in all it's metallic gold glory. I've followed the LogoLounge series since the first book when I started college, so it's an honor to be included with my design heroes. ... In some AIGA news, I recently did the AIGA Chicago Student Portfolio Review, which was a fantastic time. Consider it like design-interview speed dating, with a side of chit chat and small talk with the Chicago design community. I documented the event and threw in my thoughts and anecdotes for Richard Zeid, the education chair. You'll see that here shortly! And on an STA note, 2008 brings good fortune as I'm on the board as a Student Liasion with my good friend Keri. ... Life at the R29 is full of fun, as usual. Be sure to check out our blog, Making Creative Matter. There's Mig magic on pages 80 and 160, click to see the rest of the photos, or see all of them, and more on Flickr. Oh hey, I'm in the real world. It's been a month now, but I'm pumped to tell you I'm a freshly graduated design youngster, right out of the doors of The Art Institute. After a good Holiday season, I found a great place to call a home away from home at the always awesome strategic creative firm, Rule29. I'm planning on being active within AIGA and STA more than ever, and more importantly— catching up on the sleep I missed out on being in college for 3 years! ... In other news, I was recently plugged on Be A Design Group, a totally kickin' design blog and podcast you've probably already heard about. Thanks to Nate and Donovan for showing the love. Just because I'm graduated doesn't mean the sweet work stops flowing! Lookin' to peep some of my latest dabbles? Love my Flickr. As I sit here trying to write my speech for graduation, I wanted to drop the details on the up coming Fall 2007 Portfolio Show! Come show the love to all of my friends and I heading out the doors of the Art Institute with diplomas in hand. Here's a sneak peek at what you can expect with Mig and his portfolio display on this Wednesday's portfolio show. 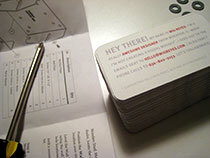 Over 100 business cards cut by hand, with love—with a side of installing and mounting to boot. At long last, the website is up and running. Albeit a few things I already want to change, some of the work is up for show. Keep coming back for updates on recent partying with the Society of Typographic Arts, interviewing Alissa Walker on the subject of design writing, and perhaps the biggest news yet: I'm graduating on Wednesday. Yikes. Congratulations to CAKE Fall 2007 for doing an amazing job with art direction. An additional congrats to the winners of the STA Student Poster scholarships, you guys created some stunning work! And lastly, thanks to those who peeped my website in the early stages and lent me awesome feedback. More to come!